Early Planting and 2015 Corn Yield Prospects: How Much of an Increase? As is the case in most years, there has been no shortage of discussion and analysis this spring of the potential impact of the timeliness of corn planting on yield prospects. Each effort tends to bring a slightly different perspective to the topic. Here we offer our perspective on the issue, beginning with potential farm-level impacts of timeliness of planting on yield potential and extending to an analysis of implications for the national average corn yield. The analysis concludes with a look at the pace of planting this year and implications for 2015 yield expectations. We have analyzed issues related to the timeliness of corn planting in several previous farmdoc daily articles (March 23, 2012; April 25, 2013; May 22, 2013; April 30, 2014). We begin by reviewing information generated from agronomic research relating planting date to corn yields at the farm-level. The information presented by Professor Emerson Nafziger in this April 6, 2012 article is typical of the information generated from agronomic research relating planting date to corn yields. The yield response curve in that article was based on the average of four sites in Illinois averaged for the five years 2007 through 2011. An updated version of the response curve for two sites in Illinois over 2007 through 2014 is shown in Figure 1 (Professor Nafziger kindly provided the updated data). The yield response indicates maximum yields associated with planting in mid- to late-April, and yield penalties associated with planting dates after late April. The yield penalties become increasingly large as planting is delayed after mid-May. The data indicate planting before April 25 produced the highest yield, planting between April 25 and May 15 resulted in modest yield penalties, and planting after May 15 resulted in more severe penalties. Results from planting date research for different years and different locations throughout the Corn Belt vary, but the reported pattern of yield response to planting date is very similar to those presented by Nafziger. Analysts often extend the farm-level yield response to draw implications for the national average corn yield. All other factors equal, higher yield expectations are associated with timely planting. Following the USDA’s weekly Crop Progress report, the timeliness of corn planting can be monitored and estimates made of the percentage of the U.S. corn acreage planted early or late. Most analysis of the impacts of planting date on the U.S. average corn yield focuses on the yield benefits of early planting. Figure 1, however, suggests that the focus really should be on the yield penalties for late planting. The increasing slope of the yield response curve indicates that the penalties for very late planting are larger than the yield benefits of early planting. At first brush, one might think that the percentage of the crop planted late is just 100 percent minus the percent of the crop planted early. However, as noted above, Figure 1 suggests that there are really three planting windows–early with little or no yield penalty, timely with very modest yield penalties, and late with more severe yield penalties. Varying percentages of the crop can be planted in each of those windows so that the percentage planted late is not 100 percent minus the percent planted early. This concept is illustrated in Figure 2. The horizontal axis measures the percentage of the crop planted early (by week 17 of the calendar year) for the period 1988 through 2014. The vertical axis measures the percentage of the crop planted late (after week 20 of the calendar year) in each of those years. As indicated by the scatter of points in Figure 2, the percentage of the crop planted late has varied substantially for a given percentage of the crop planted early, particularly in years when 30 percent or less of the crop was planted early. This is also demonstrated in Figure 3, which shows how the distribution of early (by week 17), timely (weeks 18 to 20), and late planting (after week 20) has varied each year over 1988 through 2014. The years are ordered by the amount in the early planting category and the bars add up to 100 percent. Notice the variability of the amounts in the timely and late planting categories when early planting is 30 percent or less. 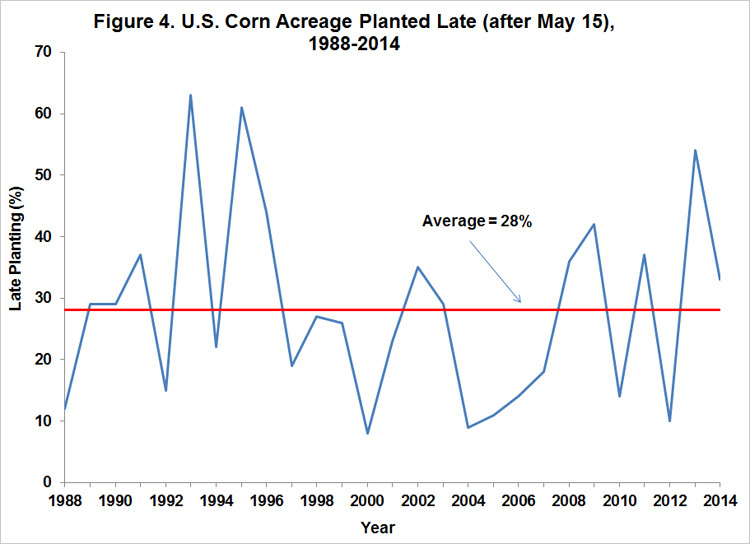 So what is the impact of the timeliness of planting on the U.S. average corn yield? Since a number of factors influence the magnitude of the U.S. average corn yield in any given year, particularly summer weather conditions, it is necessary to estimate the impact of all relevant factors in order to quantify the impact of the timeliness of planting. This is typically done with a crop weather regression model that relates the U.S. average corn yield to factors such as trend, the percentage of the crop planted in a timely fashion, and an array of weather variables. The USDA has developed and uses such a model for early season corn yield projections (Westcott and Jewison, 2013). In brief, based on observations from 1988 through 2012, the model estimates the U.S. average corn yield as a function of trend, mid-May planting progress in the eight major corn producing states, average July weather (precipitation and average temperature) in those eight states, and a June precipitation shortfall measure in selected years. The model produces an estimate that the U.S. average corn yield is increased by 0.289 bushels per acre for each percentage of the crop that is planted by May 15. In this model, acreage planted by May 15 is considered not to be late planted. As a result, the yield impact of each percentage of the crop planted late (defined as after May 15) has an equal but opposite impact on yield. Based on the USDA crop weather model, the yield impact of late planting that exceeds average (-0.289 bushels per percentage point) is not trivial. As indicated in Figure 4, the percent of the U.S. corn crop (18 states rather than the eight states used in the USDA model) planted after May 15 averaged 28 percent from 1988 through 2014, but ranged from eight to 63 percent. Late planting that exceeds average by as little as five points would be expected to reduce the national average yield by about 1.5 bushels per acre (5 X -0.289). In the farmdoc daily article of February 26, 2015, we argued that after adjusting for bias, the best linear fit of actual yields in the U.S. from 1960 through 2014 results in a trend yield projection for 2015 of 164 bushels per acre. Based on the USDA crop weather model estimates, we can now update the yield projection based on the percent of the crop planted after May 15, with U.S. planting progress used to approximate the eight-state progress in the USDA model. As indicated above, the average percentage of the crop planted after May 15 from 1988 through 2014 was 28 percent. Only 18 percent will be planted after May 15 this year. Those 10 percentage points, then, add 2.89 bushels (-10 X -0.289) to the expected U.S. average yield for this year. At 166.9 bushels, that yield expectation is, not surprisingly, almost identical to the current USDA projection of 166.8 bushels. 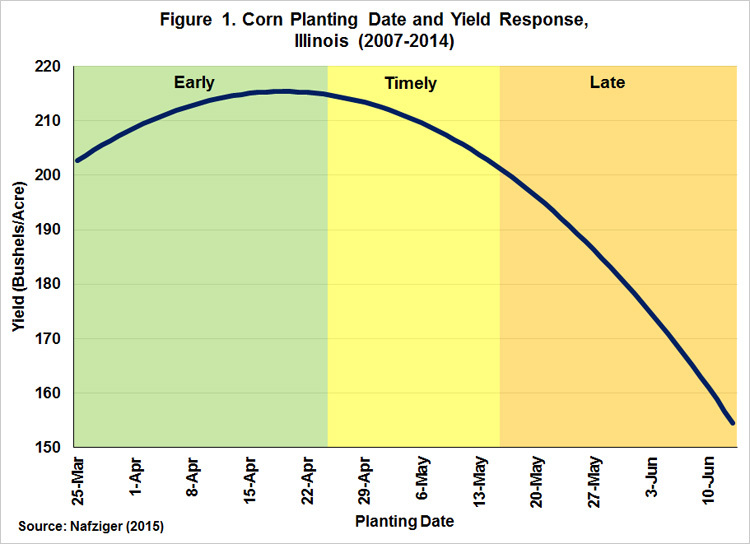 yield loss due to delayed planting is relative to the maximum possible yield in a given year. Professor Nielson also gave examples of late planted crops with above-trend yields (2009) and early planted crops with below-trend U.S. yields (2012). The reason for such divergences is not surprising–July temperature and precipitation are typically the most important factors influencing the U.S. average corn yield (farmdoc daily, June 26, 2012). This can also be demonstrated more formally by computing “elasticities” for the variables in the USDA crop weather model. An elasticity in this context is simply the percentage change in the U.S. corn yield for a one percentage point change in a particular right-hand side (independent) variable. Evaluating the expressions at the means of the variables, the resulting elasticity estimates are +17 percent, -127 percent, and +74 percent for mid-May planting progress, July temperature, and July precipitation, respectively. Given the relative magnitude of these impacts, it could be that the corn market over-reacts to planting progress in real time, particularly if the focus is on the percentage of the crop planted early rather than the percentage planted late. Agronomic research at the farm-level clearly shows that early planting of corn, all else constant, results in higher yields. However, the same research shows that the penalty for late planting is much larger than the benefit of early planting. Crop weather regression models are needed to disentangle the impact of late planting and other yield influencing factors, such as trend and summer weather conditions, for large areas. The USDA has developed a crop weather model for early season U.S. average corn yield forecasting. This model indicates the U.S. average corn yield decreases by 0.289 bushels per acre for each percentage point of the crop that is planted after May 15. We can use this relationship to update our earlier estimate of the 2015 U.S. average trend yield (farmdoc daily, February 26, 2015), which was 164 bushels per acre. Since only 18 percent of U.S. corn acres will be planted after May 15 this year, we add 2.89 bushels (-10 X -0.289) to the expected U.S. average yield for this year. At 166.9 bushels, that yield expectation is, not surprisingly, almost identical to the current USDA projection of 166.8 bushels. Since the corn market reflects both supply and demand considerations, it is difficult to determine what expected yield the market is currently trading, but it is our judgement that the market may be trading an expected yield in the 168 to 169 bushel range. Irwin, S., and D. Good. 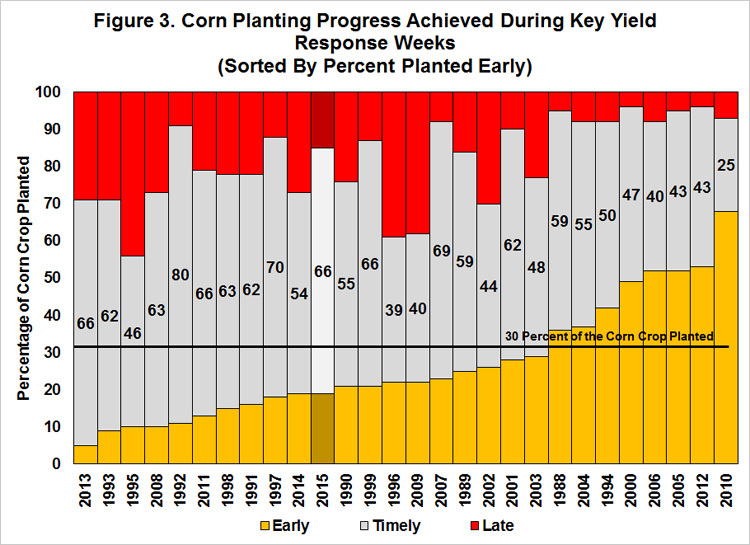 "Prospects for Timely Planting of the 2014 Corn Crop." farmdoc daily (4):79, Department of Agricultural and Consumer Economics, University of Illinois at Urbana-Champaign, April 30, 2014. Irwin, S., and D. Good. "Rapid Corn Planting Progress, But Well Below the Record Pace." farmdoc daily (3):98, Department of Agricultural and Consumer Economics, University of Illinois at Urbana-Champaign, May 22, 2013. Irwin, S., and D. Good. "How Much of the 2013 Corn Crop Will Be Planted Late?" farmdoc daily (3):78, Department of Agricultural and Consumer Economics, University of Illinois at Urbana-Champaign, April 25, 2013. Irwin, S., and D. Good. 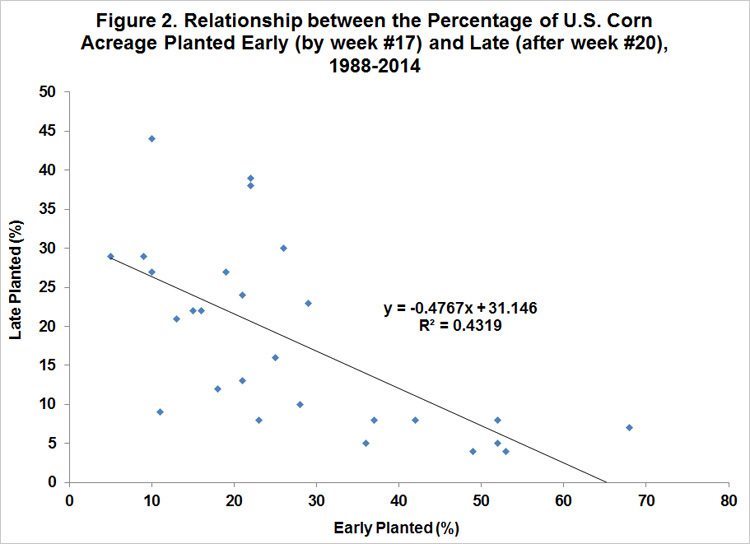 "How Much Impact Will Early U.S. Corn Planting Have on Potential Yield?" farmdoc daily (2):55, Department of Agricultural and Consumer Economics, University of Illinois at Urbana-Champaign, March 23, 2012. Nafziger, E. "Personal Communication." May 2015.